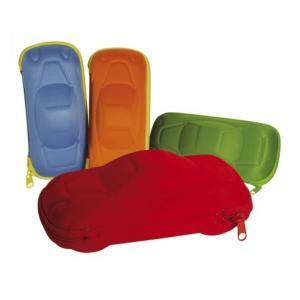 Brightly coloured, easy to find, fun children's spectacle case shaped like a car. The case has a fabric cover with a chunky zip fastening . The inside of the case is lined in a soft, grey plush. An attractive case makes spectacle wearing fun for your child. Encourages a child to use the case and reduce breakage and damage to their frames. Other Children's Spectacle Cases to choose from.